I Scream…You Scream…We all scream for (VEGAN) Ice Cream!!! So…I’ve been a bit crazy in the kitchen this week & decided to try my very first attempt at homemade vegan ice cream! I adapted the recipe from The Vegan Scoop, which encourages you to try using different non-dairy milks, so I used Silk Coconut Milk. I also could only find vanilla flavored soy creamer, so I cut down the sugar to keep it from being overly sweet. In a small bowl combine ¼ cup coconut milk with arrowroot powder, & set aside. Mix creamer, remaining ¾ cup coconut milk & sugar in a sauce pan over low heat. When it starts to boil, remove from heat immediately & add the arrowroot mixture.The liquid should thicken. Next, add the vanilla extract. Refrigerate mixture until chilled, approximately 2-3 hours. Freeze according to your ice cream maker’s instructions. ***I topped my 1st dish with some fresh mint from the CSA, then had more later with fresh apricots & strawberries from my cousin’s garden! I must say this was not bad for a first attempt & I am excited to try different flavors & variations! 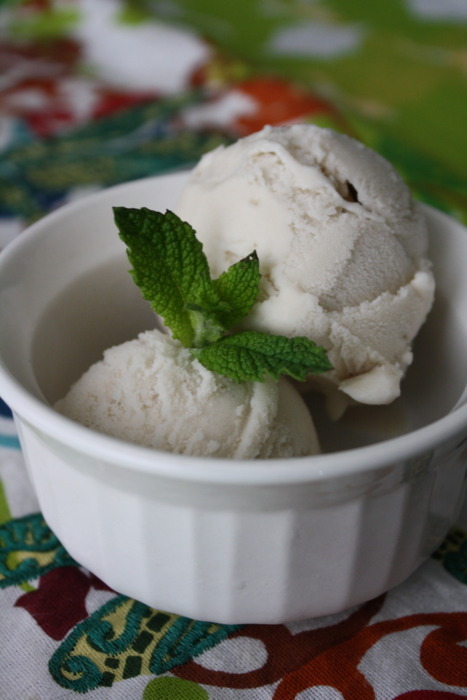 The use of coconut milk was a good call, & kept the ice cream from tasting too “soyish.” My only complaint – I wish it was just a bit creamier! Any tips, suggestions, or favorite recipes?